Now that the weather is getting warmer and the flowers are blooming, I bet you are spending more time outside and enjoying springtime! Also this is the time of year when you notice your garage is in disarray and you have been piling things up in there. I know many men find the space of the garage their area and us women are not allowed to touch anything in the garage! Here are some organizing steps to get your garage better organized to where you are not embarrassed if the neighbors drive by and see your space. The first step is to only look at ONE area of the garage to organize and not think of it as a whole. Do you want to get your tools in order, throw away and recycle old kids toys, or deal with broken garden items? If you decide to work on the kids area of the garage, throw away balls that are damaged and donate or recycle toys that the kids no longer play with. Also check out the bikes to see if the kids are too big for the bikes now. If the bikes are too small, now is a great time to donate them so other kids can enjoy riding a bike this summer! The second step to make the items in the garage that you use on a regular basis accessible. For example, keep the dangerous tools and items away from your kids reach. And in the same context, have the kids toys and bikes easy for them to get to and put back when they are done. If you can and have space, move the snow blower and other winter items to the back of the garage and the summer items to the front. If you need shelves to hold items, measure the space and go to your local hardware stores to find the correct shelving units. Most of the time a 18″ or 24″ deep shelving unit will fit just great to hold your kids items. Also make use of your vertical space and add some slatwall to the area to hang garden items, hoses and tools. The last step to getting your garage organized is to know that this area will always be in constant change. In some parts of the country we are dealing with winter and summer seasons and other parts stay in summer like weather all of the time. Most of the time your family or yourself need a drop zone in your garage for things that you will deal with soon or just need a place to put the groceries down as you get the kids settled in the house. This area should be close to the door going into your house and you can have a large bin or basket that can hang on the wall or a freestanding unit to place the bin. Every few weeks you will need to see what you have in that bin or basket and deal with the items. 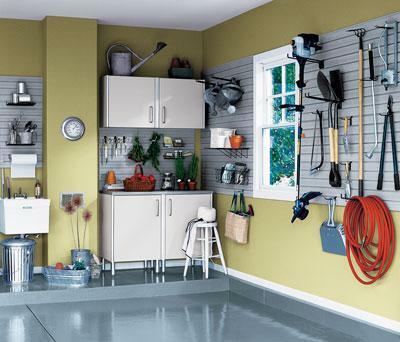 Keep it neat and organized or you will find that the items will start taking over the rest of your garage. When you start a project always know that you don’t have to work all day to finish it. I always advise that if you have a few hours to work on a specific area to organize, only work on that area and finish it! Taking on a project as the garage will happen in several steps and work on one category at a time so you will be focused in that area and you will feel a great accomplishment in the end. Take advantage of the spring weather and enjoy getting your garage in order! If you need additional advice or suggestions, please contact me and I would be happy to help you work through your project.